The Ethnicity Data Protocols describe the standard procedures for collecting, recording and using data on the ethnicity of people treated by the New Zealand health and disability sector. This data is routinely collected by doctors, nurses, hospitals and other health professionals. It is used to help in health research and develop new treatments for different ethnic groups. We have updated our protocols because the original protocols were published in 2004 and last updated in 2009. The electronic capture of data has improved immensely since then and we are now able to identify many more specific ethnic sub groups (for example, Scottish, Dutch and German instead of just ‘European’ and Filipino and Malaysian instead of just ‘Asian’). It is intended that the adoption of the Ethnicity Data Protocols by the health and disability sector will improve the accuracy and consistency of ethnicity data. Our protocols are consistent with Stats NZ’s Statistical Standard for Ethnicity and identify the minimum standards that apply across the health and disability sector. The protocols have been developed with input from a wide range of sector and government organisations. If you want to know more about the ethnicity classification codes that are to be used in conjunction with the Ethnicity Data Protocols identified in Stats NZ’s Ethnicity New Zealand Standard Classifications 2005 v2.0, go the the Stats NZ website. Ministry of Health. 2017. 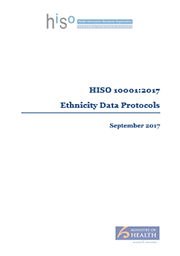 HISO 10001:2017 Ethnicity Data Protocols. Wellington: Ministry of Health.